Cort the Sport: Life accelerates sometimes - busy but happy! 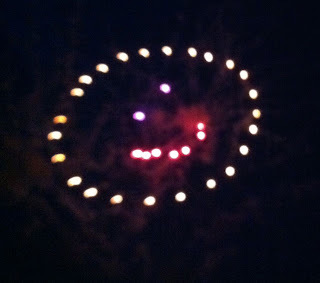 That was a picture from our local fireworks - I love the smiley face ones - and below was our "viewing platform." Suffice it to say, the kids are having a fun and relaxing summer. I do love this time of year! 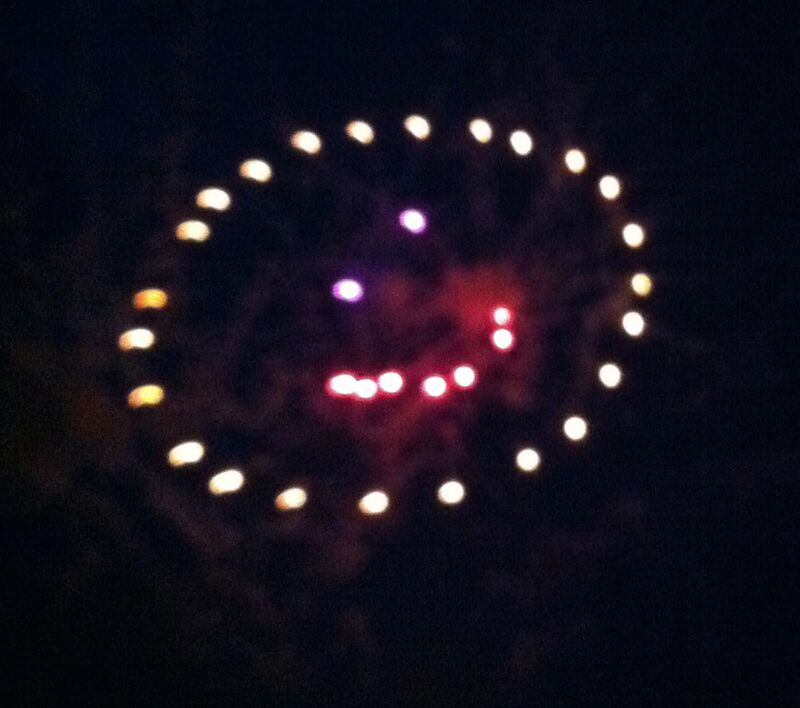 It's been a nice but busy Fourth of July long weekend. I saw a friend as I was finishing up my run on Saturday and in the course of our brief exchange she commented that "the universe is accelerating" to which I said, "my life is accelerating." Do you ever feel like that? Triathletes tend to keep life pretty filled up leaving little room for extra things. Last week threw a number of little extras my way that were just enough to accelerate my pace of life - a family member in the hospital, a car that was towed and deemed not-fix-worthy, car shopping/buying, lots of rain, decisions about a broken riding mower, computer repair, appointments with a chiropractor/ART practitioner and acupuncturist for the quad, Fourth of July, a husband bogged down and away to deal with a high-stakes project, outings with the kids, and a big week of training. So pretty much just "life"! But hey, no complaints here!! In the midst of it all was a week of 13+ hours of swim+Erg-bike-run-gym with a lot of high-intensity stuff, with some accommodations for the quad on the run. One of those workouts was a progressive intensity bike-run-bike-run-bike-run-bike-run (four rounds) done on the bike trainer and treadmill. The idea was to keep the each run short and stop shy of that fatigue point I've been hitting with the quad. Another was an open water swim and progressive intensity bike ride with my coach and two other athletes that definitely pushed me! And I finally made my way through an hour run on Saturday that was an improvement over the past few weeks. I still have a ways to go. 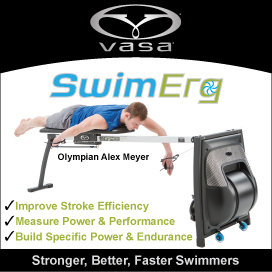 Using the Vasa Ergometer last week while Grant played Wii. The Active Release Technique work with Dr. Steve Dowell seems to be helping and I've only been to see him twice so far. The idea behind this therapy is to use manipulation to break up adhesions and scarring in soft tissue; in my case we are working to get the muscle freed up and sliding within the fascia again. It fits with my perception of what has been going on in which the quad feels like a balloon inflating within a box. When it reaches maximum volume the additional pressure is just converted to pain and fatigue. I think it's gotten stuck within the fascia, the outer wrapping of the muscle. ART has made this leg feel much "freer" -- in some ways more so than the "good" leg -- and on my run Saturday I didn't get that same build up of pressure. The last few miles were still not easy, but in a different way, so next weekend's racing will be what it will be. I'm still excited for it and will just have to take whatever the body gives me. Saturday evening the kids and I were the last three at the pool and we had a really nice time having it all to ourselves. Spencer tried valiantly to teach me the butterfly stroke which provided the lifeguard and my kids with many laughs. Then I challenged both kids to a race of 50 free, expecting to crush them both. Spencer, the 13-year-old, did a few summers of swim team but frankly he is not a kid who hurries to do anything, including race. Well, to my enormous surprise, it was a tie, and I had given it everything I had! I was so proud of him!! My message is, parents, get your kids swimming early, and on a swim team even if just for a few years. Their future triathlon selves with thank you! This week is not looking like it will be any slower or less hectic, but things seem to work out. And next week the kids and I head to Pensacola Beach where I will spend a little time with the good folks at Multisport Performance Institute and a lot of time just goofing off with Spencer and Grant at Portofino Island Resort. More on that to come!